Firefighter Asim Bishara knows it’s time to start living again. For years he’s avoided dealing with his estrangement from his Muslim family and the loss of his first love in the 9/11 attack. Through therapy, Asim begins to heal and combat his own self-loathing. He’s ready to leave his loneliness and isolation behind and find love again. Moving on is proving more difficult for Ángel Stanford. When Ángel’s husband Zach died, Ángel’s dreams of a home and family perished along with him. He always wanted to be a stay-at-home husband and father, but he never imagined he’d be raising Gracie alone. The closer he gets to the handsome firefighter—and the more Asim becomes a part of his and Gracie’s life—the more Ángel feels like he’s betraying Zach. Ángel has to give himself permission to be happy and realize that while nothing will ever replace the life he had before, the future for him and his daughter can be full of happiness… if he’s willing to reach out and take it. This story about grief is a difficult, but thought provoking read. Less than a year after the sudden death of his husband, Ángel finds his attraction to Asim very difficult to accept. Fourteen years after 9/11, Asim is still mourning the loss of his family, his culture, and his first love. Closeted Asim struggles to accept his sexuality and Ángel’s flamboyant sexuality initially brings out the worst in him. While I felt deep empathy for both of these men, I found it difficult to truly love either of them. Both men make choices that hurt each other and the people around them. Angel’s fear of commitment is realistic, but it makes for a very angsty romance. Fourteen years hiding in a closet have deprived Asim of confidence and made him more than a little bit clingy. Neither man is always likeable. The actual romance is long and slow with very little story to support the relationship. I grew a little bit tired of the hesitant, tentative relationship at times. But there were sweet and tender moments that redeemed the men and made me cheer for their relationship. Readers will need to be in the right headspace for this story because it is heavy and dark at times. This is a sensitive exploration of grief and new love, and the writer shares some important insights with her readers. LOGAN MEREDITH began writing as a teenager when beautiful boys started keeping her company at night. Unfortunately, the voices she heard were imaginary, and their conversations resulted in horrible insomnia. They only let her sleep when she started typing their words down. Thankfully, being awkward as hell and a head taller than anyone else in the school afforded plenty of spare time for writing. At first, she tried to make them play with characters from her favorite television series or books. She found her lost tribe with a ravenous, crazy group of fanfiction lovers online and started sharing her stories publicly. Then something amazing happened: new characters arrived and started demanding their own stories. Only they wanted their own world to play in and they wanted to find their true loves. So between her day job and making time for her family, she tries to keep up with the demands from her beautiful men for their happily ever afters. A native of San Antonio, Texas, and a graduate of the University of Texas-San Antonio, Logan currently resides in Indianapolis, Indiana. In addition to writing, she spends her time reading and re-reading her favorite books, cheering for the San Antonio Spurs, playing Words with Friends, and procrastinating pretty much everything else. Logan is a proud member of the LGBTQA community and vocal advocate for mental health awareness, suicide prevention, and marriage equality campaigns. Logan welcomes the chance to interact with readers. 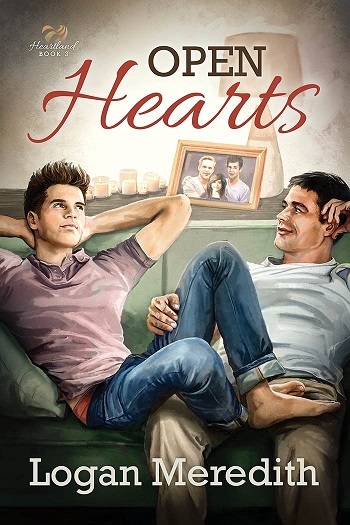 Reviewers on the Wicked Reads Review Team were provided a free copy of Open Hearts (Heartland #3) by Logan Meredith to read and review.